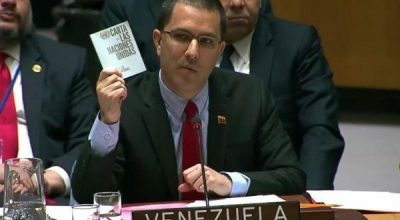 26 Jan 2019 – This morning Venezuelan Foreign Minister Jorge Arreaza [above] presented a brilliant defense of President Maduro’s government, against the attempted coup d’etat engineered by the United States and its proxies in Europe and newly right-wing Latin American countries Peru, Brazil, Argentina, Colombia and Ecuador. The United States called this “emergency” meeting, seeking the authorization of the United Nations Security Council for intervention in Venezuela’s internal affairs, and the infamous regime change similar to that which spread chaos in Libya and Iraq after the UN authorized military intervention to overthrow the governments of Saddam Hussein and Omar Khadaffy. South Africa, Equatorial Guinea, the Russian Federation, China, Caricom, Bolivia, St. Vincent and the Grenadines, Cuba were among the countries which opposed what has now become transparent violation of international law, and the usurpation of the independence of the United Nations to conceal geopolitical engineering, otherwise known as capitalist imperialism. US Secretary of State Michael K. Pompeo denounced Russia and China for opposing a Presidential Statement condemning Maduro’s government, and Pompeo singled out Cuba as the arch-villain propping up the government of Maduro, which could be understood as a backhanded compliment to Cuba’s power. In fact, Cuba has helped build the medical and educational system of Venezuela from the earliest days of the late Hugo Chavez’s Presidency. Venezuela’s Arreaza began citing an almost endless list of U.S. military interventions and invasions of sovereign Latin American countries, and the reimposition of the Monroe Doctrine, recalling the 1912 US marine invasion of Mexico, the destabilization and overthrow of the democratically elected Guatemalan President Arbenz, Brazil’s Goulart, Chile’s Allende, and the replacement of these democratically elected governments with fascist dictatorships whose human rights violations and barbarity rivaled some of the worst savagery of Nazi Germany. The Venezuelan Foreign Minister denounced the coercive blockade denying the Venezuelan people many billions of dollars, in addition to the 1.2 billion dollars frozen in Belgium, and other US European proxies etc. etc., which has led to the widespread hunger and collapse in the living standards of the Venezuelan people, many of whom are migrating to other countries. When France and Germany called for regime change in Venezuela, citing massive demonstration against Maduro as undercutting his legitimacy, in an almost comic rebuttal to France, Russian Ambassador Nebenzia mentioned the massive demonstrations of the “Yellow Jackets” opposing French President Macron’s policies, and the question was raised regarding the possibility of demand for regime change in France. Ambassador Nebenzia quickly reassured the French delegation that he did not intend to call a Security Council meeting for that purpose, but his point was well taken, and had its effect. Perhaps most incriminating among the charges of imperial designs against Venezuela’s sovereignty was Arreaza’s statement that last year President Maduro had invited the UN Secretary-General, and European High Commissioner Federica Mogherini to monitor the forthcoming Presidential elections in Venezuela, to determine their legitimacy or otherwise. In a breathtaking disclosure, Arreaza revealed that both the UN Secretary-General and the EU’s Federica Mogherini refused to be present to monitor the Venezuelan Presidential elections, stating many months prior to the elections that the election outcome would be a fraud. This indicated collusion, and a deliberate premeditated intent to discredit the outcome of the Venezuelan elections, whether or not they were in fact legitimate; and this collusion in demonizing Venezuela’s election is an indictment of gross prejudice and corruption within the very organizations charged with impartially evaluating the quality of those elections. Russian Ambassador Nebenzia stated that Germany’s attempt to invoke “preventive diplomacy,” as an excuse for intervening in Venezuela’s internal affairs was, in fact, a deliberate incitement to civil war in Venezuela, and had nothing to do with prevention. It is difficult to know what will ensue, but the stark division within the Security Council, and additional fierce opposition to Security Council or unilateral intervention voiced by neighboring countries in the region near Venezuela, indicates that the threat of U.S. military intervention will have difficulty influencing the outcome of events, especially since Russia has warned the U.S.: “Hands Off Venezuela”!!! Carla Stea is Global Research’s correspondent at the United Nations Headquarters, New York, N.Y.